It is that time of year again when the crème de la crème of Hollywood come out in force for Oscar Sunday to compete against each other for award based glory. Oscar Sunday is undoubtedly the largest night of the Hollywood Calendar where actors, actresses, producers and directors alike turn out in their over priced outfits to see who will win the accolades. Thanks to the wonders of modern technology, the public can now harness the power of the Apple iPhone and iPad and watch the Oscars as it has never been seen before. The ABC Digital iOS application can be downloaded free of charge from the App Store which gives an ultimate insider view of Hollywood’s biggest evening. The application gives exclusive access to twenty four cameras placed in unique locations throughout the venue, backstage and even at the Governors Ball giving viewers the ability to see more live action than ever before. The application itself is only available to residents in the United States and doesn’t actually stream the television broadcast. 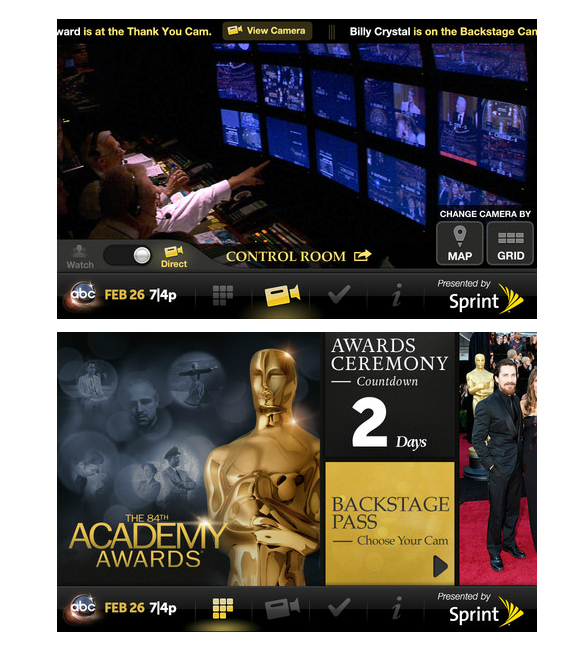 The ABC Digital produced application makes every downloader a virtual member the Academy Awards providing insider information about all of the goings on inside the Kodak Theatre. By switching the application to WATCH mode, users can enjoy the live hosted experience from the Red Carpet. So what about users who prefer to choose their own vantage point? Yes, you guessed it, the application has you covered as well with DIRECT mode which lets you pick one of six camera vantage points which even gives the ability to zoom in and out. The newest version of the application brings various bug fixes and app improvements as well as providing an exclusive behind the scenes experience. The app creators have also added social sharing features with content able to shared via a users Twitter account. There can be no excuse now to tune in and see which plastic actor wins best actor for a mediocre movie. The Oscars application requires an installation of iOS 4.2 or above and is compatible with the iPhone, iPod touch and iPad. More action. More access. More glamour, all from the comfort of your arm chair.